This Strawberry Spinach Salad recipe is loaded with sweet sliced strawberries, crispy bacon, sliced almonds, and feta cheese. One of our favorite salads to eat as a meal. Alice Currah of SavorySweetLife.com shares this recipe. See the full post at Kitchen Explorers. In a blender, add vinegar, olive oil, sugar, poppy seeds, paprika, and onion. Blend for 30 seconds. 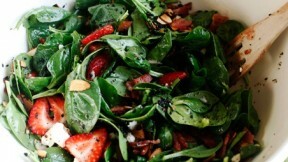 In a large bowl, toss spinach, strawberries, bacon, almonds, and feta cheese with half the poppy seed dressing. Add more dressing if you need to, otherwise save the rest for the next time you make the salad.